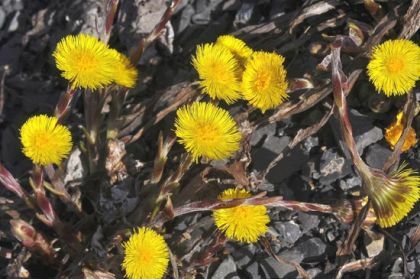 Colt's-foot is not easily confused with other wild plants on this web site. One of the first flowers to poke its head up before the end of winter, the robust little yellow blooms of the perennial, Colt's-foot, brighten up any day from February to April. The solitary flowers (15-30mm ) are made up of numerous narrow rays (like petals) and disc florets (the centre) giving this member of the Daisy family a sun-like appearance. The erect flowers appear on pinkish stems covered in scales and before the appearance of the large heart-shaped leaves. Where the leaf-stalk attaches to the leaf there is a ‘U’ shape which was thought to resemble the foot of a colt, hence the English name. The Latin name Tussilago refers to this plant’s properties to cure coughs – Tussere meaning to cough. The seeds are distributed by means of a ‘clock’ or pappus. This widespread plant is a native and belongs to the family Asteraceae. I first identified this plant growing beside the Shanganagh River, Co Dublin in 1977 and photographed it at Bannow Bay, Co Wexford in 2005 and Mullingar, Co Westmeath in 2009. 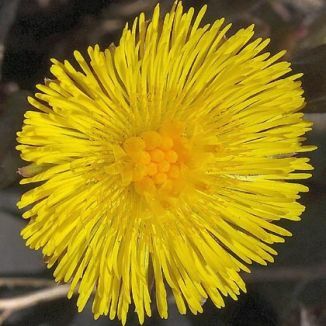 ‘Coltsfoot tea is good for asthma or throat troubles’. From the National Folklore Collection, University College Dublin. NFC S. 468:66 From Kerry.